To go along with some of our Classic Sailor Moon voice veterans Linda Ballantyne, Katie Griffin, and voice director John Stocker, Otakon has two more voice actors to add to the list. Sailor Moon’s new voice actress Stephanie Sheh will be attending the convention, as well as our new Tuxedo Mask, Robbie Daymond! 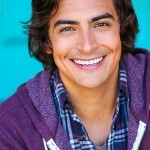 See their press release here! Otakon has also planned a Sailor Moon Saturday in partnership with Viz Media to celebrate the 20th anniversary of the show! To start, they are inviting cosplayers to attempt to break Anime Expo’s largest U.S. Sailor Moon gathering Saturday morning. Then in the afternoon, attendees will be treated to a preview of the new Classic dub, along with a Q&A with Stephanie Sheh and Robbie Daymond after the episodes are shown. Also, Otakon has stated that this event will feature two never before seen dubbed episodes! There will be an exclusive poster to go along with the Official Sailor Moon Autograph Session hosted at the convention too! Then in the evening, the first two Sailor Moon Crystal episodes will be screened to round off the day. For more details, see their press release here. Viz Media will bring in some special items for the convention as well. These will be offered throughout the weekend at their booth in the Dealer’s Hall, but quantities are limited when they’re gone, they’re gone! Our first item will be a limited edition Sailor Moon coin, in an exclusive color for Otakon. This coin can be earned by participating in the Sailor Moon Stamp Rally. Simply ask one of the Sailor Guardians at the Viz booth for a stamp card and then go off on your search to collect stamps and defeat the Dark Kingdom…And earn that fancy coin. Note: These will be handed out in a limited quantity per day. 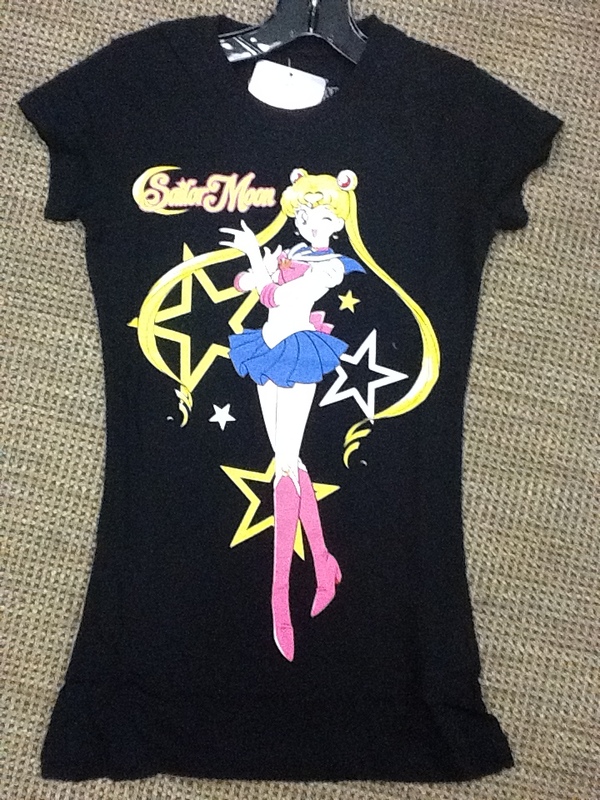 The other exclusive Otakon product is a Sailor Moon T-shirt! It will be available in both ladies’ and men’s sizes (S, M, L, XL, XXL) and will feature metallic pink lettering on a “deep heather silver” 100% cotton shirt. The third item is the aforementioned poster, which shall be given out for free at the Autograph Session and the Sailor Moon Panel. Once again, quantities are limited so be sure to get yours ASAP! Fans in or near the Niagara region may be interested in checking out the Niagara Falls Comic Con this summer, which will be running June 6-8, 2014 at the Scotiabank Convention Centre in Niagara Falls, Canada. Some of the Canadian Sailor Moon cast members will be appearing as guests. Linda Ballantyne (Sailor Moon #3), Katie Griffin (Sailor Mars #1), Susan Roman (Sailor Jupiter), Toby Proctor (Tuxedo Mask #2), and John Stocker (Voice Director #3) will be appearing all three days at the convention. Admission is $25 for a single day ticket, or $60 for the weekend. More information about the Niagara Falls Comic Con (including details of other guests) is available on their website and their Facebook page. So, this article is going to sum up what’s been going on in the last little while. This will be the last article until the next time any of us has the time to work on the site. Rest assured though, we always have our eyes on Sailor Moon (just that there aren’t enough hours in a day to work, travel, watch, and write about Sailor Moon). This update was written by 3 members of our staff. Teamwork FTW! (The Me) We will get to our review as time permits. Everyone on staff has copies of the manga now, just that time is a problem again. We like what we see so far though! The books are about 10% bigger in width and height than the original Japanese books. 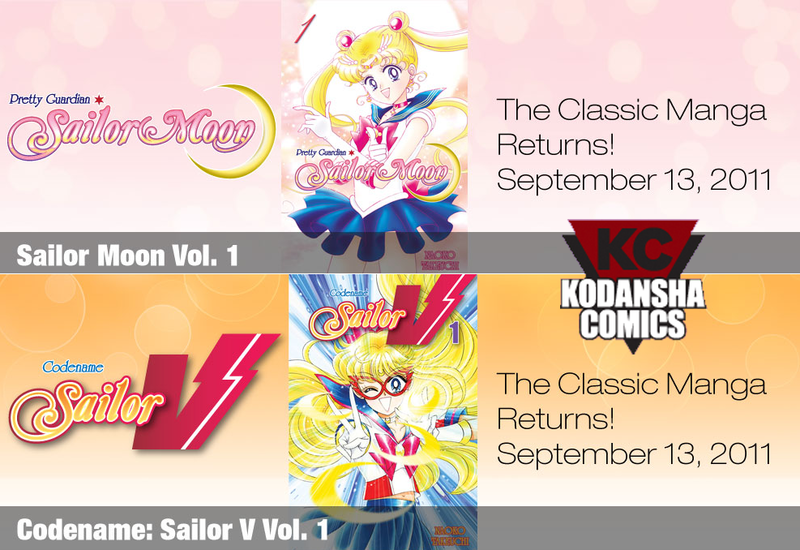 Both Sailor Moon and Codename Sailor V have also been dominating sales lists (Week 1, Week 2, Week 3), which is not without consequences. Despite fears that the books have been pulled from shelves, the real problem is that people are snatching them up and stocks are running low at the moment. Amazon as well as some independent distributors are experiencing a stock shortage (we learned from our contact at Kodansha USA yesterday), but for the time being Barnes and Noble seems to have a decent stock left. A big thank you goes to all the fans who’ve helped put Sailor Moon at the top of the charts! Not only has it beat such titles as Negima, Pokemon, Full Metal Alchemist, xxxHolic, and One Piece, but it’s knocked chart topper Naruto’s 52nd volume down to #3 and it has even beat new titles from Marvel Comics and DC Comics! Thanks to everyone who has showed their support for our beloved Odango Atama, the companies are getting a clear message that Sailor Moon is just as, if not even more popular than it was the first time around! We are still waiting for the list of retailers. And fans, please do your part and support the official releases. Supporting official releases sends a strong message to everyone of fans’ desires for legitimate releases of Sailor Moon. Terri Hawkes Appearing in Florida! (Moonie1995) There is good news for English Sailor Moon fans who became fans of the show with the original DIC dub back in the 1990’s. Terri Hawkes, who voiced Sailor Moon for most of the original DIC run, as well as the 3 Sailor Moon movies, will be the Guest of Honor at Florida Anime Experience 2012 in Orlando (dated May 27-29, 2012). This appearance marks Terri Hawkes first convention in 11 years as well as her first U.S. convention. For fans of the original English dub, the voice of Terri Hawkes is synonymous to the Sailor Moon experience, and it will definitely be a treat for anime fans in Orlando to learn about her experiences voicing one of anime’s most popular characters. Our image we have here is from her last live-action movie appearance – 2004’s math and psychological thriller Cube Zero. Sailor Moon Rocks Hot Topic! (Sailordees) I have been fortunate enough to get every shirt Hot Topic has released, as well as the costume! So here come my one sentence reviews on everything. White Sailor Moon Logo Girls T-Shirt – Love it, nice to see something based on the R-series, wish it wasn’t so see-through. 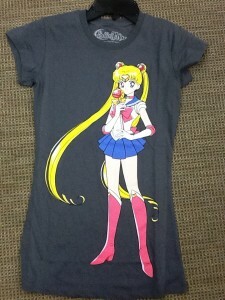 Black Sailor Moon Sailor Senshi Girls T-Shirt – Love it, I’ve worn this one a few times out and about, I wish Sailor Mercury’s hair wasn’t so green and that it wasn’t so see through. Black Sailor Moon Purrrfect Girls T-Shirt – this shirt looks a lot less cheezy in real life compared to what you see on the screen, nice to see something with the cats, wish (again) it wasn’t so see through. Grey Sailor Moon Hero Girls T-Shirt – of all the shirts, this is my least favourite; Sailor Moon was also always known to save the day and Tuxedo Mask was more of a helper, and he never really seemed like much of a hero to me; once again this design looks a lot nicer in real life than it does on the screen, and wish that this too, was not so see through. Black and White Sailor Moon Group Girls Raglan – a week and a half ago, I made a day trip to a mall with one of the biggest Hot Topic stores in the nation and to my surprise this was there; I love the retro look of this design, but once again I wish it wasn’t so see through and I wish that the sleeves and the bottom of the shirt had cuffs and hems sewn; I won’t be wearing this until I have access to a sewing machine so that the material doesn’t fray. Also at said mall was the Sailor Moon Costume by Leg Avenue – I was surprised at how well made this costume was and I think any cosplayer will be satisfied with this costume; the headpieces don’t look as cheap as they do on the video, and this is actually roomier than all of the tshirts; I was pleasantly surprised but I still think it isn’t worth the steep price tag (maybe about 20 bucks less). And finally, the White Sailor Moon Costume Tee (yes, this is what it is officially called) that isn’t online yet – this is actually a little more wider cut than the other shirts so those who found the other tshirts a little too snug may actually be able to get into this one; again, wish it wasn’t so see through, but neat idea for those of us who want to dress more casually on Halloween. For those who are having a tough time finding this tshirt, some have it on display but not out on the shelves. The people at my local HT were nice enough to go pull one out from the back for me last weekend (thank you, you two know who you are and I’ll probably see you again soon). The SKU for the tshirt is 19537004 for those of you who are wanting to know when your local store will stock it. I have heard it was supposed to be online but I don’t see it up yet (EDIT: Here it is!). On the bright side, many stores are getting rid of their tank tops and camis from the summer, so fans have lots of options to make sure that only the characters on the shirts are being seen and nothing else. Oh, and I have some big news for you all from Emily (who contacted our contact at Hybrid Apparel last weekend)! The mens tshirt was finally shipped from Hybrid Apparel to Hot Topic and should be in stores in a week or so! The mens sizes at Hot Topic are a lot more forgiving than the womens, so hopefully everyone can fit into this one! As if that announcement wasn’t enough, we have a new interview on the way! John Stocker has been a director of cartoons from all over the spectrum, but he will be best known to fans as the director of the 3 Sailor Moon movies, as well as the S and SuperS seasons. We are delighted to have this opportunity! Fans are limited to two questions each, but please don’t ask any questions that everyone is probably going to ask (what was your favorite episode and/or character, will you return for Sailor Stars etc.) because those are already on our master list. Remember, don’t feel like you are limited to just asking about Sailor Moon since he has worked on so many other shows as well. We will set the deadline for getting your questions in to 12 AM on November 1st. Leave your questions and a name we can credit you with as a comment here, on our forums, or send us an email at moonchasers@NOSPAMPLZKTHXgmail.com with “John Stocker” in the subject line. Do not leave your questions on our Facebook page as they will get lost easily. We will not be going through those posts and looking for fan questions. Oh yeah, and we are keeping our fingers crossed. A week ago we got an official sign that things are moving in a very positive direction for something. Stay patient, Moonies. Comic-Con to Feature Guests from Kodansha and Random House! 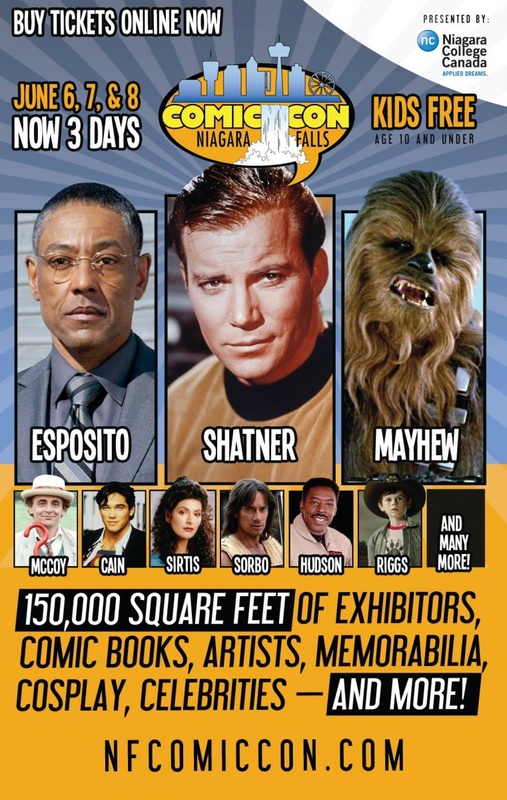 For our Moonie fans who are headed to San Diego’s Comic Con from July 21-24, we have an appearance that you might want to attend! 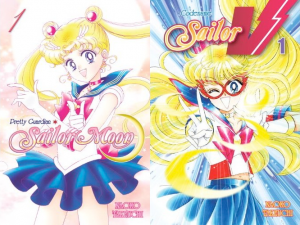 Though there is no one appearing related to the Sailor Moon anime this year, there are two very important people attending related to the Sailor Moon manga. 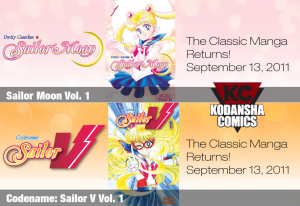 The first is Dallas Middaugh, an Associate Publisher at Random House who is handling a lot of the aspects of the upcoming Sailor Moon and Codename: Sailor V releases (side note: also one of our Moon Chase contacts! 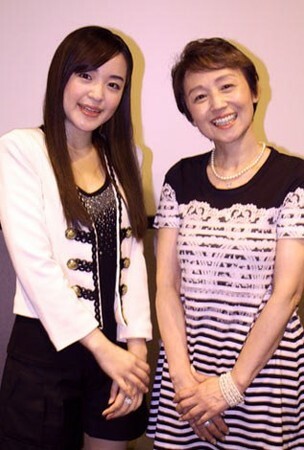 ), and Kumi Shimizu, the General Manager of Kodansha Comics USA. Their panel will also have information about other upcoming manga titles alongside Sailor Moon and Codename: Sailor V such as Bloody Monday, Cage of Eden, Tokyo Mew Mew, Shugo Chara Chan! and Love Hina. This panel will be in Room 23ABC from 4:00-5:00 PM on Thursday, July 21st. Any moonies who are able to attend Comic-Con, please let us know how the panel goes! For more information please check out the official schedule here. Fans can check out information about all of Kodansha’s upcoming titles at the official website for Kodansha Comics USA here.